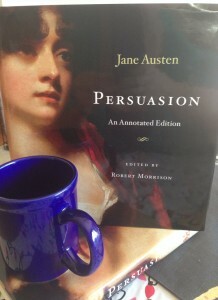 12 years ago, I first read Jane Austen’s Persuasion. 12 years later, I am rereading Persuasion, and my perspective on this novel and Austen is quite different. Obviously, I’m older. I’m married. I avoided spinisterhood; although, avoiding spinisterhood was not the reason I married my Redneck Romeo. Just making sure that fact is perfectly clear. But it is important to note that Jane Austen and her words didn’t change. Sure, Janeite scholars may offer new ways of reading and understanding Ms. Austen, but her novels didn’t change in those 12 years. I did. For so many others, Mr. Darcy will always be my first Austen love. You never really become disloyal to your first Austen man. Ever. I’m sure to do so breaks one of the Ten Commandments of Austen. But I’m going to let you in on a little secret–Darcy is only an awesome guy because Elizabeth Bennet is an amazing woman. In reality, I’m a bit tired of the romanticized and hero worshipped Darcy. Maybe, this is my age showing, but I have grown weary of headstrong lead men bumbling through proposals and insulting women of “lower” class rankings. Where are the men of steady character? The ones who show up and don’t lead the leading ladies on and for goodness sakes, have the decency to look well in a uniform. Enter Captain Wentworth and Anne Elliot’s story. I can’t exactly put my finger on when I began seeing this novel differently. When I elevated its status above my beloved Bennets and Darcys, but I did. All of the Jane Austen tropes are there–drama queen sister, good looking man, lovely woman who isn’t quite as pretty as (insert other female character), overbearing and foppish parent. All present in Persuasion, but I’m not drawn to what makes Jane Austen’s writing hers. I am finding that I love the quietness of this novel. How it isn’t the most polished work, but I know these characters better than some of my relatives (I’m completely okay with this). So 12 years later, I’ve learned this–I really love Persuasion more than Pride and Prejudice. Wonder what kind of penance I will need to do for breaking one of the Ten Commandments of Austen?